I’ve been trying to get a few reasonable photographs of my Geckos to show on the blog. 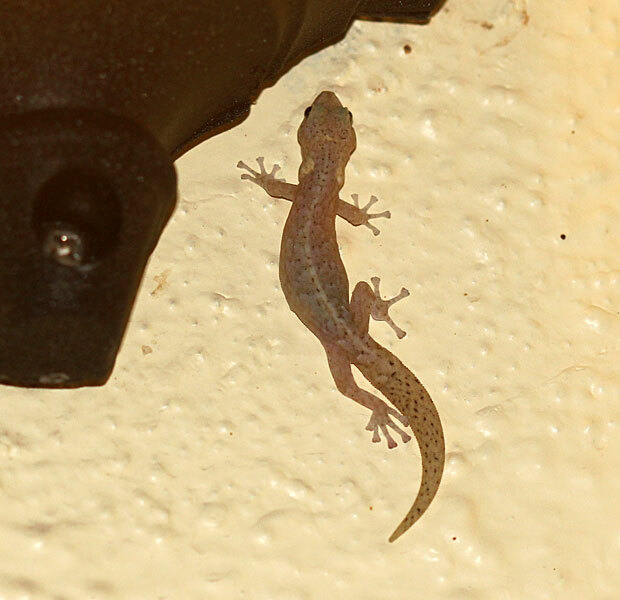 I have always had geckos, and this year there seem to be a lot more than usual around. My geckos only come out at night – they are around during the day but tend to hide under rocks, behind walls and in pots and whatever else they can find to escape from the heat of the day. Can’t say I blame them. Temperatures have been in the range of 38 – 40°C (100.4 – 104°F). So getting photographs of them is not that easy for me. For starters, I’m a useless photographer at the best of times and second, night-time is particularly challenging for me. 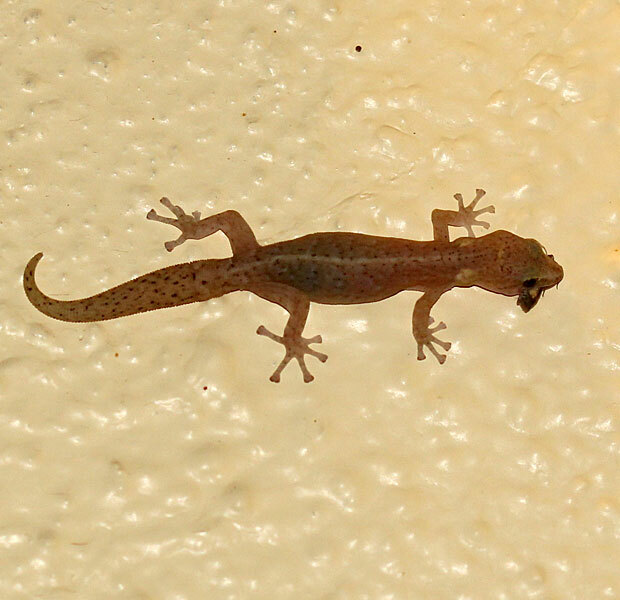 So imagine my surprise when my latest attempt at catching a few shots of the friendly terrace gecko turned out to be ok – and I managed to get a shot of the gecko as it went for its prey and then munched on it. I wasn’t aware that was what I had photographed until I was looking at the photos on the computer. See the bug with the arrow pointing at it? Bon Appetite! I don’t think they actually eat the stink bugs (or do they? ), but they sure eat all the moths. There are two of them living on the terrace under this light fitting. They come out every evening as soon as the moths come to the light. See? A good reason to waste a little bit of electricity. I need to feed my Geckos! 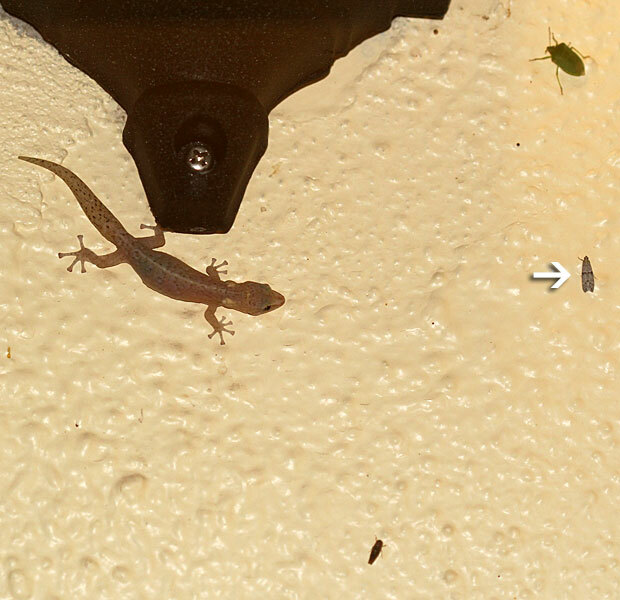 There is a very large Bibron’s gecko that has his haunt outside around my study window. He usually keeps his patrols to the perimeter of the glass as he’s a little shy, but every now and then he’ll overcome his shyness to dart out across the glass to snare some tempting, unsuspecting prey item like a moth. I like seeing him from the other side of the glass, because from beneath I can see his pale white underbelly, legs and toes. I have yet to get a good photograph of him owing to his restlessness. It was all the rage here a number of years ago to keep geckos as pets, maybe still is for all I know. Naw not a rubbish photographer, these wildlife pics are too good. They’re so cute! How cool that you captured it having a bite to eat. We had one living in our bathroom in a small basket on the floor for a while…guess it was eating little spiders? I finally wrapped it up in a t-shirt and set him free outside. Not sure if he was happy about that or not! Moths are very important pollinator . Awe – amazing!! That looks like a happy fellow! 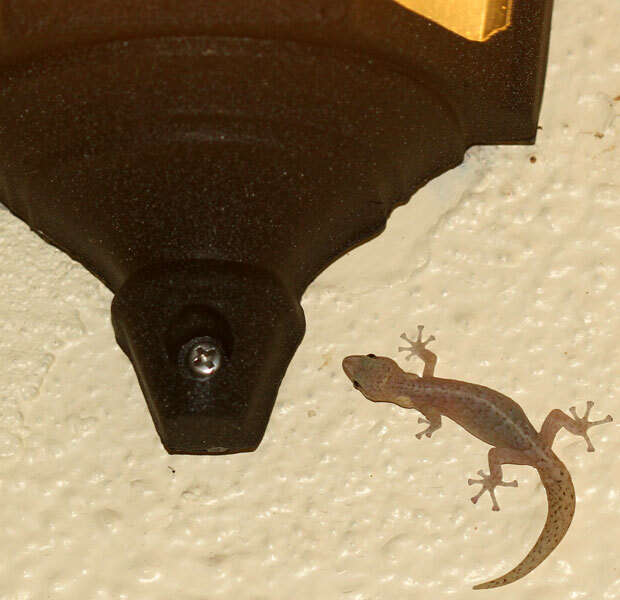 I wish we could have geckos – it’s too dry here, I guess!! But I have some other weird and wonderful bugs – will post today! got geckos in Porterville, in the house! Excellent catch (both you and the gecko)! Whenever I see something eating small moths, I wonder “is it worth it?”. They seem like they’d be a lot of dry powdery wings and very little juicy parts. 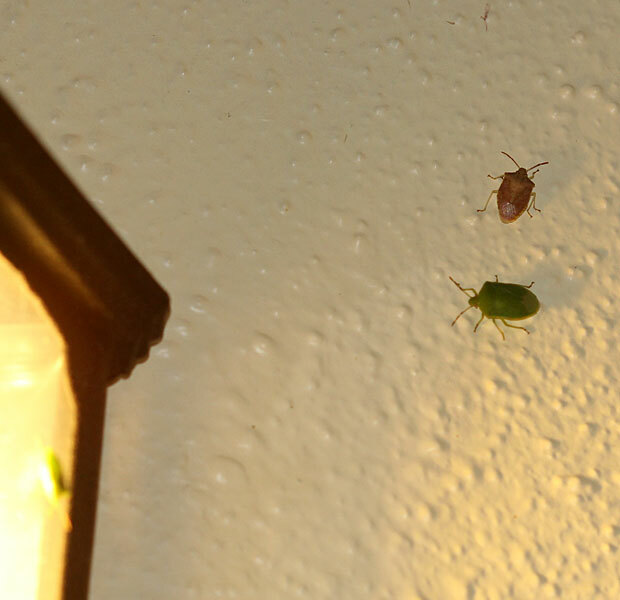 I think the stinkbugs give off an odor that discourages them from being eaten…darn!!! I love geckos. 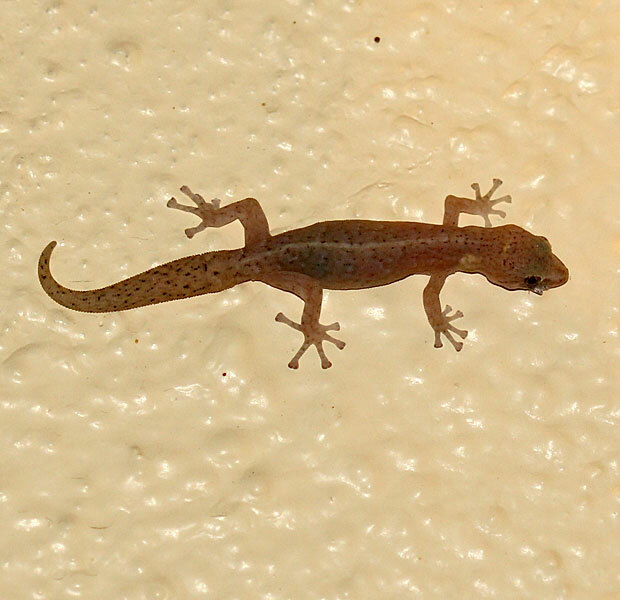 Whenever my husband and I vacation in tropical regions, I enjoy watching the geckos…so adorable. You captured him so well in these shots. I’ve never seen a gecko. I didn’t know they were semi-transparent like that. Love its feet.